(CNN)—In ruling California’s death penalty unconstitutional, a federal judge said on July 16, 2014, the system is so broken it unfairly leaves inmates with uncertain fates — often for decades. 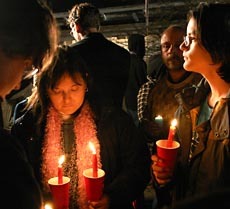 Katrina’s Dream is holding a Candlelight Vigil and Community Assembly on February 3, at 4:30 pm. Meet at the West Gate of San Quentin Prison. People of all faiths will be gathering, calling on Governor Jerry Brown and our Legislators to Close the Death Chamber at San Quentin Prison and abolish the Death Penalty here in California. Download press release. California announced it would no longer try to defend its current lethal injection protocol. In May, a court ruling invalidated the state’s three-drug lethal injection protocol because state officials failed to follow administrative rules in adopting the protocol. In response to a wave of violent crime in the San Jose area over 100 persons attended a prayer service and vigil at the Rotunda at the San Jose City Hall on June 6th. The event was organized by Kathleen Flynn, herself a family member of a victim of homicide. The audience was addressed by the acting police Chief Esquival, Mayor Reed and a number of local clergy. The Court of Appeals affirmed judgement that the state’s lethal injection regulations violate the Administrative Procedure Act. The latest poll of the Public Policy Institute of California (PPIC) shows less support for death penalty. The Executive director of Death Penalty Focus, former warden of San Quentin State Prison, former undersecretary and director of the California Department of Corrections and Rehabilitation is interviewed by Rev. Michael Carson, Pastor of Queen of Apostles Church in the Diocese of San Jose. Measures Will Require Parental Notification and End the Use of the Death Penalty. On August 10, 2011, the California Supreme Court directed the Santa Clara County Superior Court to hold a hearing to consider the evidence that David is mentally retarded. If the court finds him to be retarded, he would be resentenced to life without parole. The case has not yet been assigned to a superior court judge, and the schedule for the proceedings in the superior court has not yet been set. There will be many procedural steps before the case will be ready for a hearing. The case will be decided by a judge alone, without a jury. Lawyers in the San Francisco office of Morgan, Lewis & Bockius, a large international law firm, have taken on David’s case pro bono. The pretense of lethal injection as a peaceful and painless way to execute prisoners is unraveling, and this may change the face of the death penalty in the United States.